You are here: Home / Store Deals / Walmart / *HOT* High Value $3 off South Beach Diet Bars only $0.98 at Walmart!! 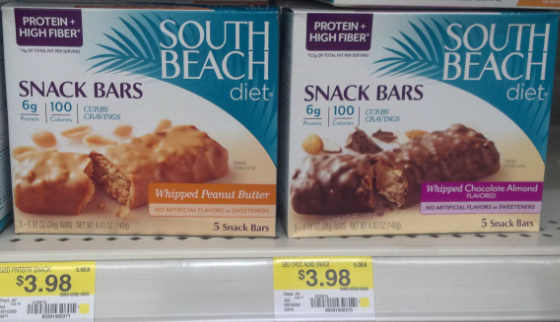 *HOT* High Value $3 off South Beach Diet Bars only $0.98 at Walmart!! 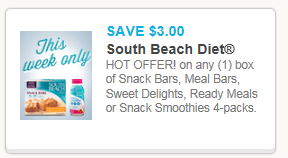 Hurry on over to Coupons.com to print this $3.00 off on any (1) 4 pack of South Beach Diet Coupon and score South Beach Diet snack bars for under $1!! Hot diggity, I’m excited 😀 These are great to keep in the car when your running low on energy or time! Print your coupon now, they wont last long!